Offering you a complete choice of products which include delight serving tray, celebration serving tray and passion fancy serving tray. We have a variety of Delight Serving Trays in round, oval, square, rectangle, capsule shapes. Our delight serving Trays are available in various sizes and specifications. 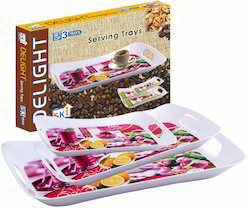 These delight serving trays can be availed at industrial leading price. 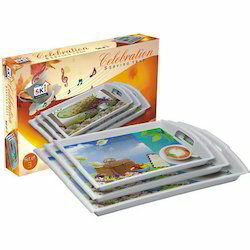 We are an eminent name, which is engaged in delivering Designer Serving Tray. The offered range of designer serving trays is available in different customized specifications to comprehend and meet the diverse requirements of esteemed clients. Along with this, the offered range of designer serving trays is suitably checked on different parameters to maintain its authenticity throughout the designing process. This range is available in loose & 3pc tray sets. We mainly supply in Mumbai and Foreign markets. In order to append and respond to the diverse requirements of esteemed clients, we are able to offer Passion Fancy Serving Tray. The offered range of fancy serving trays is manufactured utilizing premium grade raw material and innovative technology that are handled by diligent personnel. Along with this, our quality experts make sure to inspect the entire assembly of fancy serving trays utilizing stringent methods to maintain its authenticity. This range is ideally applicable in parties, festival, and allied occasions.